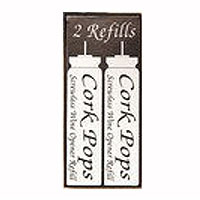 Cork Pops cartridge refills come conveniently packaged two canisters per box so you can enjoy your Cork Pops over and over. Each canister contains a highly tested, safe propellant that removes the cork from the bottle without affecting the taste of the wine. One canister will open approximately 60 to 80 bottles before requiring replacement. Cork Pops maintains its all-important customer pledge of an environmentally safe product by compliance with EPA regulations. Comments: Works great and pulls all corks with ease.I have used it for about 5 years and have found it fast and easy.